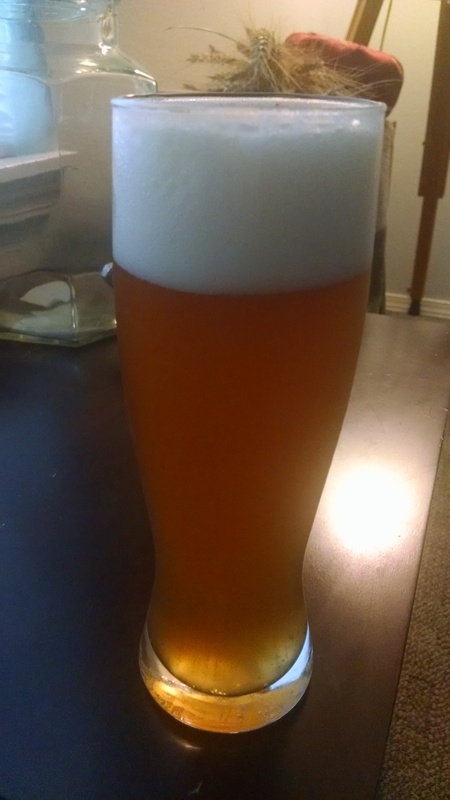 Appearance: The beer is a pale amber and slightly hazy with a large pillowy head of foam that dissipates very slowly and never fully goes away. Quite a bit of lacing here as well. Aroma: Grainy with a touch of an earthy herbal aroma and some fruitiness with a hint of lemon that comes out more as the beer warms up. Taste: This is a malty beer with a fruitiness from the yeast and the herbs involved, it actually harmonizes quite well, nothing dominates. It’s not bitter but there is some hiding in the background, due to the beer’s dryness it, again, balances very well. Mouthfeel: There is good body, it’s not thick like the spruce ale, but a nice body that sticks in your mouth for a bit after swallowing. Overall Impression: This beer is very good, it’s extremely well balanced (toward the malty side). Considering that it’s a ‘herbal’ (not sure if cypress counts as a herb?) beer it’s not punching you in the face with either the cypress or the lemon balm and if you weren’t told they were in there you may have difficulty picking them out.